The coldest temperatures of the season will arrive here next week. Another run-in with cold air arrives in DC by Wednesday morning, making for the coldest temps of the season so far. Very cold air is always trapped up in the polar region of the Northern Hemisphere within a strong circulation known as the 'Polar Vortex'. It's not a new term, just one that's become popularized in the past number of years. What this circulation does is trap in very cold air -- like a gate holding in a herd of cattle. In winter, this circulation can weaken, allowing for some of the cold air to spill southward into Canada and in a modified form into the U.S. This week, a cold airmass spills southward from Canada and into the U.S. along with a big dip in the jet stream. 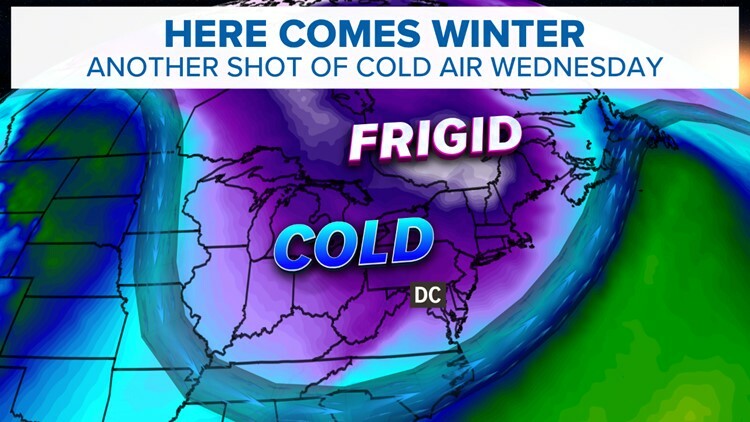 Graphic: Visualization of the cold air intrusion, set to arrive in DC and the Mid-Atlantic by Wednesday, November 14th. App users click here. The cold air comes rushing into the Mid-Atlantic next Tuesday night and settles in by Wednesday morning, November 14th. Wednesday will be brutally cold day for November standards across D.C.
How Cold will it be in DC? Our models are in great agreement of the extent of the cold. Temperatures Wednesday will struggle in the upper 30s northwest of town and in the low to mid 40s in the metro and southern Maryland. For perspective, our average high temp for Wednesday is 58°. These temperatures will be about 15° below average. It will not be record cold. For DC, the daily record is 35° from 1908. Dulles' record is also 35° from 1996. But just like this weekend's run-in with cold air... there's also gusty winds to factor in! Tuesday night's lows will drop down into the low to mid 30s, but factoring in the blustery winds, it will feel bone-chilling cold! 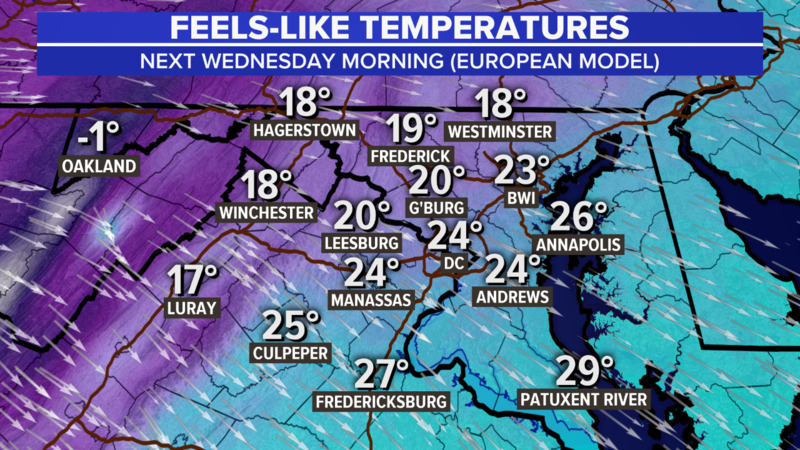 Below is a look at the European Model's depiction of wind chills (feels-like temperatures) Wednesday morning, 11/14. App users click here. 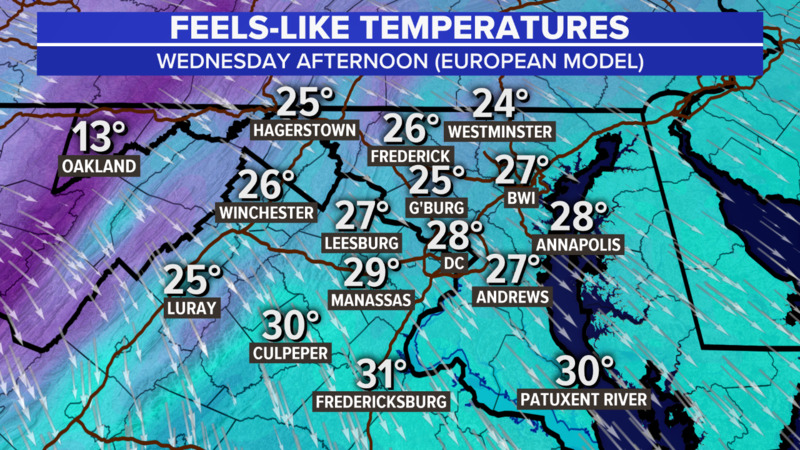 Wednesday stays blustery and cold -- here's a look at afternoon feels-like temps. They'll stay below-freezing! You'll need to dress in multiple layers to stay warm, including hats and gloves. App users click here. How does this cold weather make you feel? Share your thoughts with us on Facebook and Twitter, using the hash tag #WUSA9Weather!